There’s no shortage of news reader apps and services 7 Best iPad News Apps to Follow the Latest Headlines 7 Best iPad News Apps to Follow the Latest Headlines Whether you're hungry for the very latest happenings or just looking to catch up on the week's events, your iPad is a great news reader. Read More . For some of us, Twitter and Facebook do a good enough job. Then there are intelligent services like Nuzzel How to Make Sure You Never Miss Breaking News on Twitter How to Make Sure You Never Miss Breaking News on Twitter With the speed of Twitter, it can seem impossible to stay up to date with everything going on in real-time. Here are two methods you can use to never miss breaking news again. Read More that show us stories that multiple people in our network are sharing, but you have no control over the actual feed. 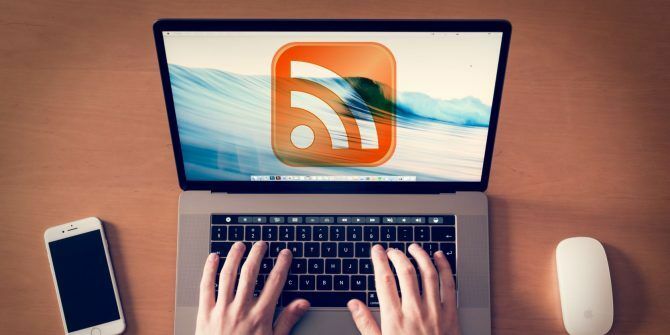 If you’re looking for a fast way to get news updates from specific sources, RSS is still the only reliable way to go about it What Is RSS and How Can It Improve Your Life? What Is RSS and How Can It Improve Your Life? Read More . Subscribe to your favorite feeds, organize them in folders, and browse through the updates as they arrive. RSS apps make this process more pleasurable by streamlining the process and giving you control over your feed. Here are the best RSS readers for macOS. Reeder 3 is the best Mac RSS app if you value the reading experience above everything else. The app is polished, fast and filled with intuitive gestures and shortcuts. Even if you’re loading 5,000 unread articles, it still won’t set your MacBook fans blazing. Reeder supports most popular syncing services like Feedly, Feed Wrangler, Feedbin and so on. It will even import your Instapaper feed Instapaper Premium Is Free: 6 Features You Can Try Now Instapaper Premium Is Free: 6 Features You Can Try Now Instapaper Premium is now free. Here are the six read-it-later features that could make you both a better and more productive reader. Read More (but sadly there’s no support for Pocket). And of course, you can use it without any syncing service. On the Retina MacBook 13-Inch MacBook Pro With Retina Display Giveaway 13-Inch MacBook Pro With Retina Display Giveaway That's right, a beautiful, Retina display-toting 13-inch MacBook Pro could be yours for the low cost of $0. Read More , reading articles displayed in the crisp San Francisco font is a joy. So is smooth scrolling in the list view. The app also has a couple of different gorgeous versions of dark mode. From the default white layout, you can switch to something beige, gray, dark gray or full-on black. I’m personally a fan of the simple Dark version These Popular Apps Support Night Mode on iOS These Popular Apps Support Night Mode on iOS Not all iOS apps offer night mode, but the important ones do. Since night mode can work wonders for your eyes and your sleep, you should use it whenever you can. Read More . The app has a three-pane UI. You’ll see your folders and sources in the first pane. The articles in the second and the article text in the third. Once an article is selected, just swipe left on the trackpad to open it in the built-in web browser. Or just press the keyboard shortcut (G) to expand the truncated article right there. Reeder might not have pro level filtering options, but if a premium reading experience is what you crave, Reeder 3 is worth the $9.99 price of admission. Feedly for Mac is a free app. If you’re really into Feedly These New Feedly Features Make It Easier to Digest Your RSS Feeds These New Feedly Features Make It Easier to Digest Your RSS Feeds Feedly's latest update came with three new features: Boards, Notes, and Highlights. Here's how they can help you be more productive and organized with your RSS feeds. Read More and all of its features, this is the RSS reader app for you. The app hasn’t been updated in over 3 years but that’s not an issue because it’s just a wrapper for Feedly’s website. You get all the functionality of the Feedly website in a dedicated window on your dekstop. As it’s a web wrapper, you’ll miss out on some of the classic RSS features like offline caching of synced articles. What you get instead is all the over-the-top features that Feedly’s web app is famous for. If you use the Feedly app on your iPhone or if you like Feedly’s features such as starring, saving, Boards, popularity ranking of articles and so on, you’ll like using Feedly for Mac. Just keep in mind that offline support is non-existent, and it’s not a “proper” RSS app like Reeder is. I’ve heard people describe ReadKit as Reeder’s slightly-less-attractive sibling. While that’s not a wholesome way to describe an app, there is some truth to it. Design-wise, ReadKit doesn’t hold a candle to Reeder 3. That doesn’t mean it looks bad or it’s unusable. Structurally, ReadKit’s design is quite similar to Reeder: the three-pane UI, the sharing features, the typography options, the keyboard shortcuts, and so on. While Reeder focuses more on the reading experience, ReadKit focuses on filters and gives you more control over what you see. First of all, you can read your Pocket, Instapaper and Pinboard feeds in ReadKit. The app also has Smart Folders support, allowing you to filter stories by a tight set a criteria. You can create a folder that only lists articles that contain specific words, or from specific sources, that were published in the past 3 days. If you think you’d value this level of granular control over your feeds, check out ReadKit. Vienna is the only open source RSS Reader on this list. The app is free and only syncs with Open Reader-compatible services like The Old Reader and InoReader. Vienna can only be downloaded from the GitHub page and while it runs well on macOS Sierra 11 macOS Sierra Things You Couldn't Do in El Capitan 11 macOS Sierra Things You Couldn't Do in El Capitan Every new macOS release introduces new tricks and features, and macOS Sierra is no exception. Read More (sync was quick and painless), it doesn’t look like it belongs in the present. The design language is still from the pre-Yosemite redesign phase and on Sierra, and it sticks out. Design issues aside, Vienna is a solid, stable and feature rich RSS reader. The main reason to choose it is arguably its price tag of free. Your choices don’t end there. There are other RSS readers with, more specific feature sets that didn’t quite make the top four. Yes, you can use Safari as an RSS reader 15 Essential Safari Tips and Tricks for Mac Users 15 Essential Safari Tips and Tricks for Mac Users Look beyond the obvious and unearth the usefulness of Apple's fast and energy-efficient web browser. Read More using the Subscriptions feature. Open a new tab in Safari, enable the sidebar using the Shift + Cmd + L shortcut and click on the @ icon. Click on Subscriptions and then select Add Feed. It’s called RSS Reader and it’s a simple menu bar utility 9 Handy Apps for Your Mac’s Menu Bar 9 Handy Apps for Your Mac’s Menu Bar Most of us glance at the Mac menu bar for the date and time, but with a few apps it can do much more. Read More that displays your RSS feeds in a floating window. Just as the name suggests, it’s very minimal and simple. You can’t sync with a service or import an OPML file. If you want a quick way to view new stories from specific sources, this little $1.99 menu bar utility is for you. Leaf is a visual RSS reader. It has big and bright UI elements as well as eye-catching icons for websites. But if you value the actual reading experience, Leaf won’t be the right fit for you. Do you still use RSS to read your favorite news sites? Which RSS service and apps do you use? Share with us in the comments below. At this point, what can't Thunderbird do? Since the death of Google Reader, I've been using AOL Reader mainly because I switch between a PC and a Mac on a daily basis. Woah! I had no idea that was a thing. How is the app? The iOS one hasn't been updated for 3 years now.